Bruce and Annie Knowlan have loved the outdoors all their lives. Growing up in Minnesota they frequented the lakes in the northern part of the state in the summer. Each autumn they traveled to the South Dakota prairies to enjoy the bounty of the fall migration. The Knowlans so appreciated the Prairie Pothole Region’s beauty and bounty, as well as the friendly farmers and ranchers they met in northeastern South Dakota, that they decided to purchase their own a piece of paradise there. They enjoyed many fall hunts and built meaningful friendships built since they purchased that land. They also restored both upland and wetland habitats and enrolled those acres in long-term conservation programs. 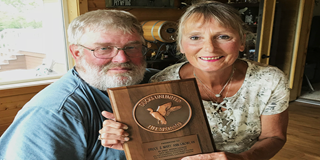 Having shared their property with many family members and outdoor enthusiasts, the Knowlans now plan to leave this treasured place to Ducks Unlimited to ensure that it will be protected and enjoyed by future generations as well. 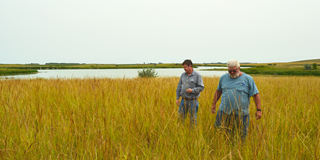 Bruce walks property with Steve Donovan, DU's manager of conservation programs in South Dakota. In 2017, Bruce attended an Evening of Conservation event hosted by DU in Aberdeen, South Dakota. There he discovered the difference that DU is making on the landscape and how he can contribute to the organization’s conservation mission. He and Annie have since become DU Diamond Life Sponsors and President’s Council members. Now they intend to bequeath their South Dakota property to DU through their estate plans. Among the many benefits of making a gift of real estate to Ducks Unlimited are: capital gains tax relief on the sale of the property, a charitable tax deduction based on the value of the gift, leaving a legacy for future generations, and the potential for the land to be used as a match for new public grants that provide a larger conservation footprint on the landscape. To learn more about making a gift of land to enhance DU’s conservation efforts in South Dakota, contact Director of Development Terry Kostinec at 605-760-5791 or tkostinec@ducks.org. General inquiries about DU’s Major Sponsor and Feather Society programs can be directed to Director of Gift Planning Chris Cole at 901-758-3763 or ccole@ducks.org.